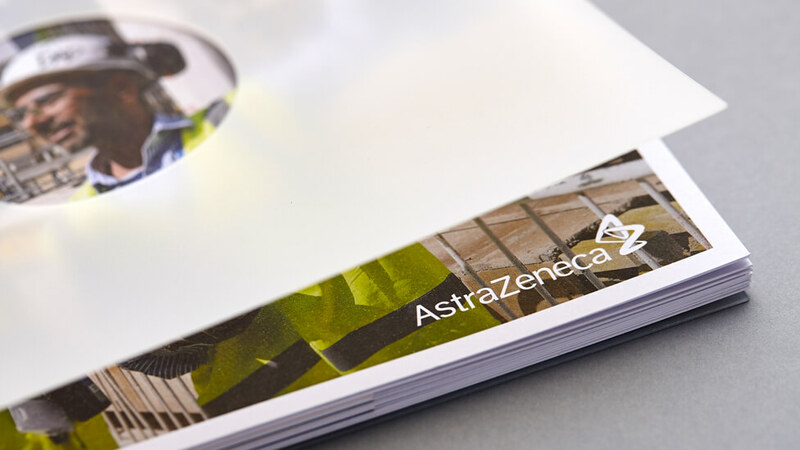 We empowered AstraZeneca team members to prioritise safety with an employee engagement brochure that helped reduce accidents and incidents across its construction sites worldwide. 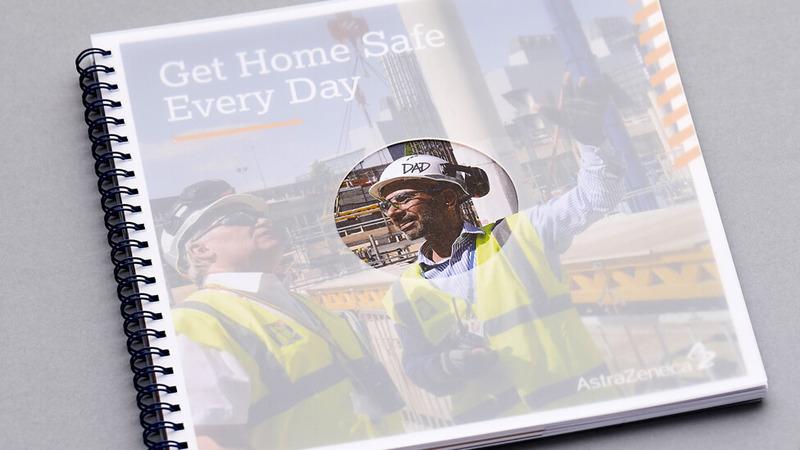 With a bold ambition to have zero accidents and incidents across its workforce, AstraZeneca’s Global Engineering team needed a way to help construction site employees understand their role in maintaining a safe work environment. Although committed to getting each of their staff members “home safe every day,” the company wanted employees to become more personally involved in this mission. 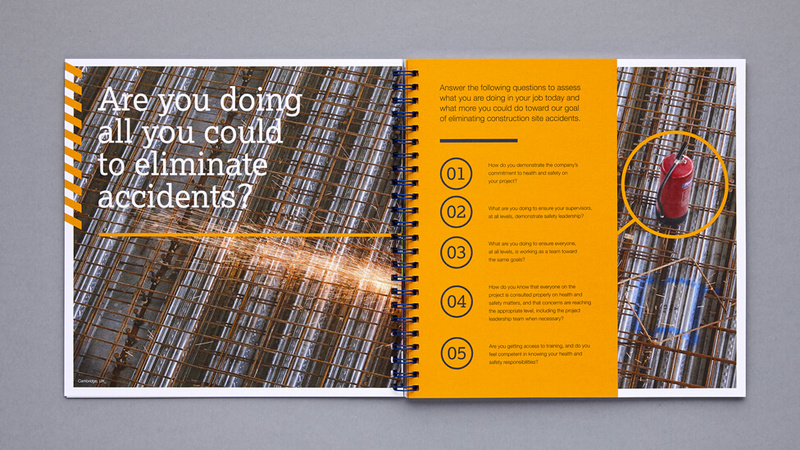 We needed to encourage employees to go beyond simply identifying safety risks, helping them to recognise how their actions could have a life-changing impact on colleagues. 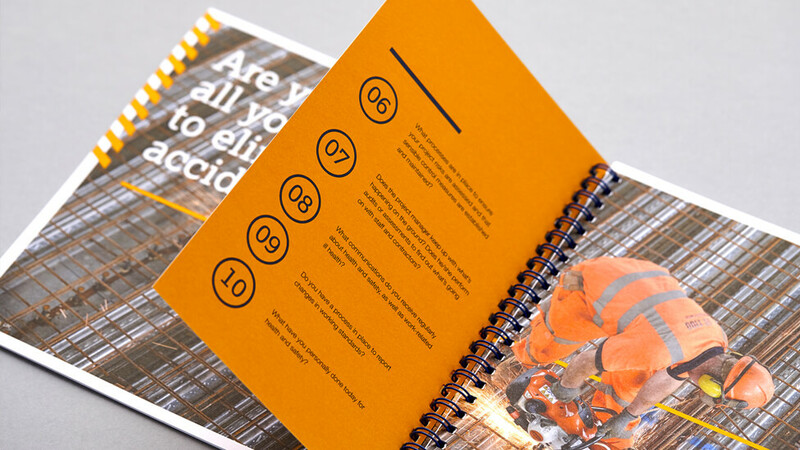 The client also wanted to educate staff, empowering them to take the appropriate steps before, during and after an accident to ensure the best possible outcome. 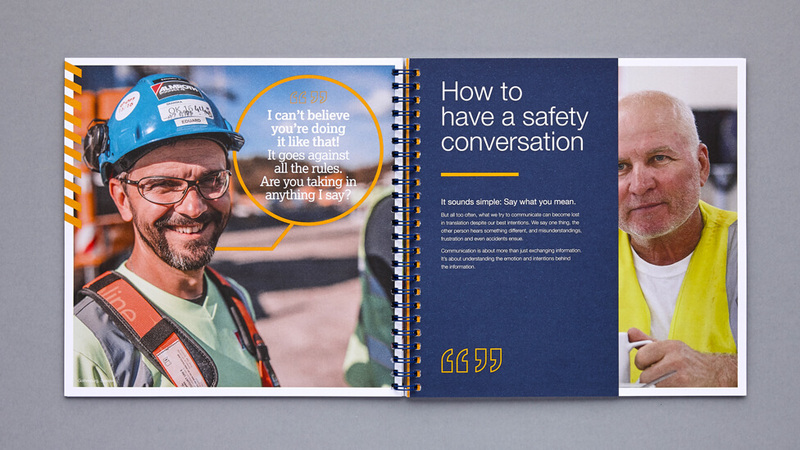 To drive home the human impact of work site accidents, our design team set out to create an employee engagement brochure that would get colleagues to see one another as real people. 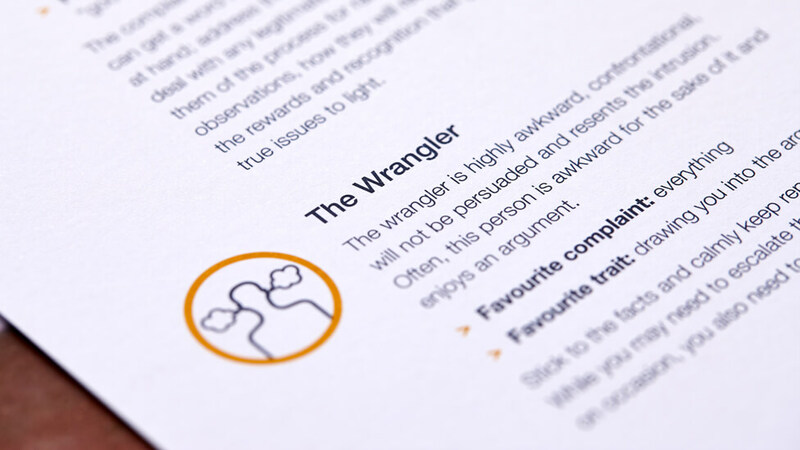 Part employee handbook and part resource guide, the piece outlined company safety procedures, while also offering helpful information about how to approach difficult discussions and engage effectively with different personality types. To establish authenticity, we sourced local photographers and organised photo shoots at AstraZeneca work sites in Sweden, China, UK and USA. 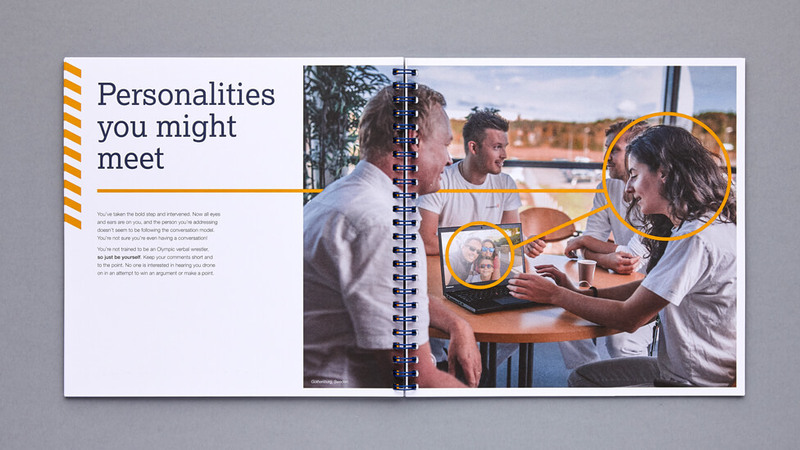 We then combined the educational content with photos of actual employees, allowing us to emphasise the importance of each person as an individual and create immediate buy-in. The creative team decided on a 210mm sq format, which was compact and convenient, but also differentiated the brochure from other internal materials. 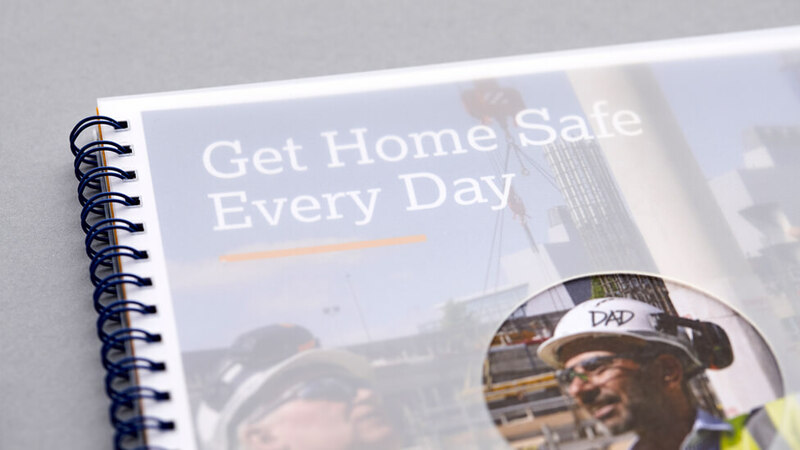 We used clever design elements and visual cues – such as names on hard hats, family photos, and a ‘greatest dad’ mug on a desk – to create a human connection and encourage staff to take a personal interest in the safety of those around them. 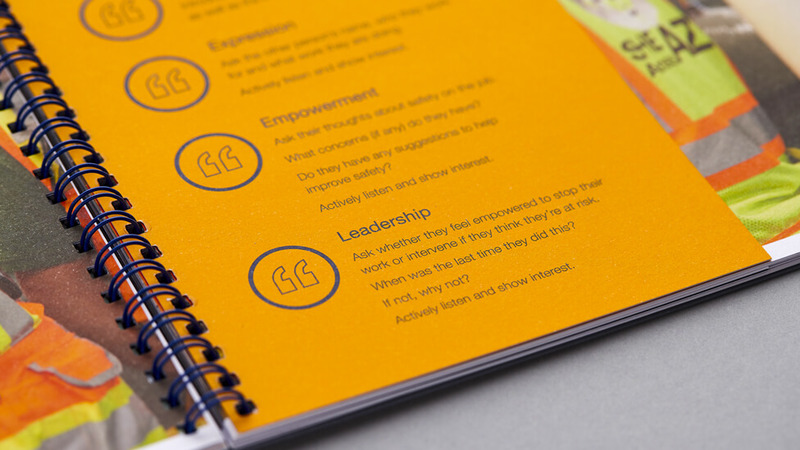 The employee engagement brochure was extremely well received by internal teams, helping to support a more collaborative work environment and reducing accidents by empowering staff to look out for one another. 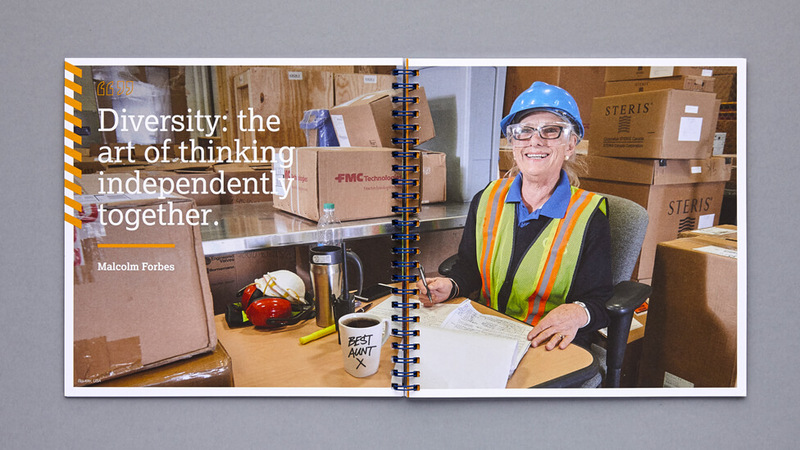 A plastic cover, spiral binding and coated paper stock increase the manual’s lifespan, making it a sturdy and effective on-site resource. 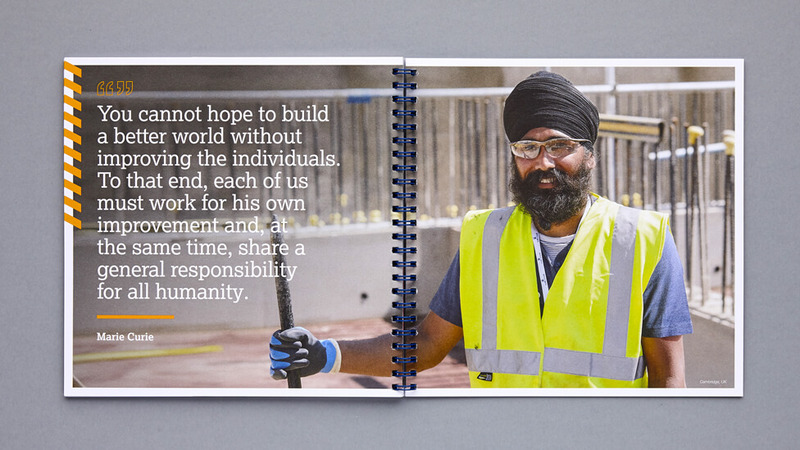 The hero image on the front cover immediately draws the reader’s eye from the wider image to focus on a single individual, strengthening the “people first” message in an indirect way – a visual strategy that is used throughout the brochure design. 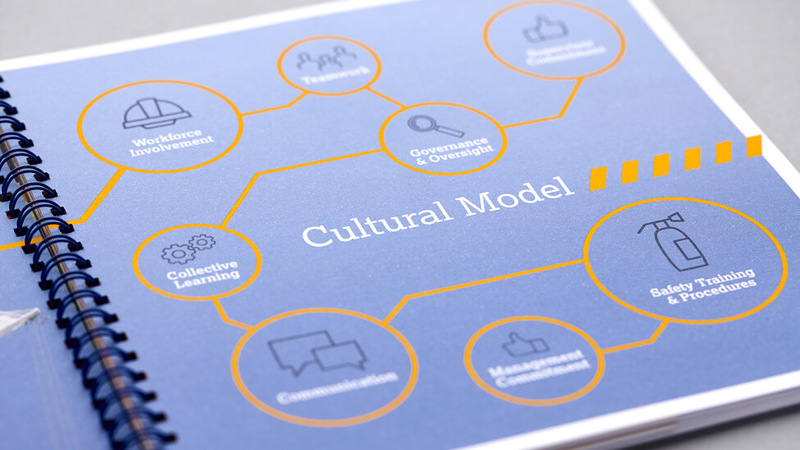 The use of infographics and icons simplifies information to make company policies and best practices easy for employees to understand. 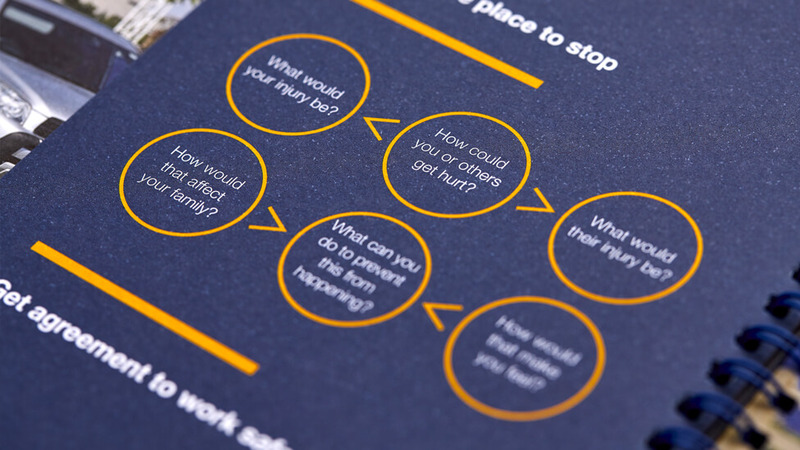 By working photographs of people into the design, we were able to change staff behaviour by helping them recognise that accidents have human consequences. 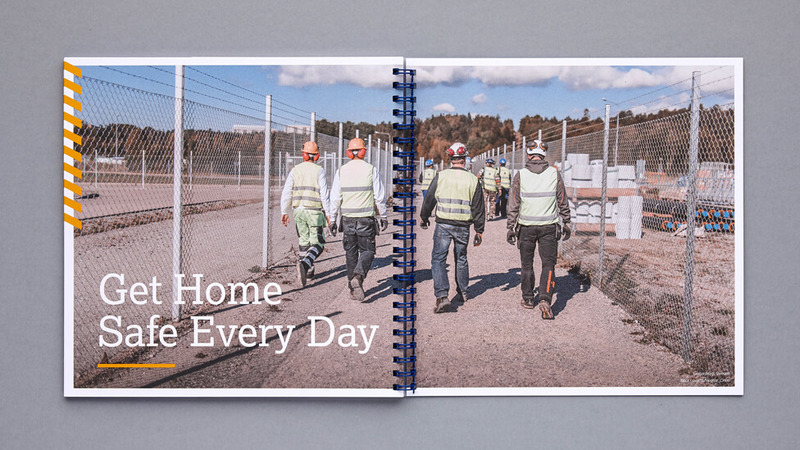 This supported the company’s aim to get each of their employees “home safe every day”. 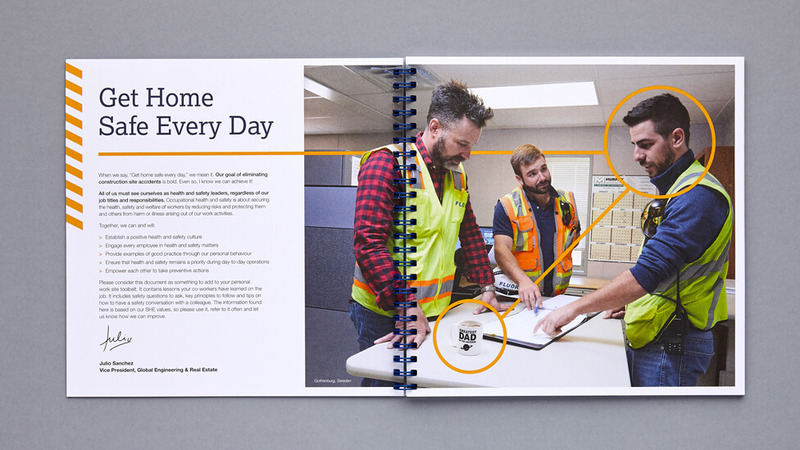 We designed a variety of internal communication materials to support the client’s key safety messages, including a booklet, web pages, email and PowerPoint presentation templates, and digital assets for the company’s plasma screen network.